CFC: April Dishcloth ~ Talk about our Pets! 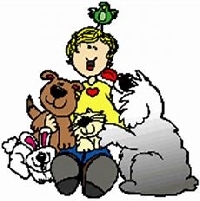 National Pet Day Celebrated annually on April 11th, National Pet Day is an unofficial holiday that encourages all of us to pay our pets some extra attention. It is also a day to commemorate everything that our pets do for us on a daily basis. So if you have a pet, you can do something special for them on this day by taking them for a long walk; buying them a special treat or maybe, just by spending a little bit of extra time with them. After all, don’t they deserve it? Send a letter telling about your pet....What kind? Coloring? Name ? Where did you get it? When? Inside or outside Pet? etc. Package securely -- Correct Postage and Don't forget your Letter about your Pet. Start on your dishcloth as soon as you sign up..